As 2016 comes to an end, you’re probably reflecting on your year and thinking about how you can be better in 2017. You know teeth, but being a business owner means that you should always have your hand on the pulse of your practice. These include your goals, finances, trends, competitors in your area, industry analysis and more. Doing so allows you to be well informed and agile, giving you the ability to make the right decisions at the right time for you and your practice. Let’s go with option number 4, increasing patients. In part of being specific, you have to drill down this goal to determine how you will achieve these results and what kind of time/money allowance you will have to get the results you want..Asking for referrals, taking on a new software, dedicating more resources to your current efforts. There are a number of options you could take, but whatever you may choose it should be results oriented, so you can track your efforts. If a 20% increase in patient volume is your goal, make sure it is attainable; is your city large enough to grow to this extent? How many new dentists are entering in your neighborhood? Are there corporate practices nearby? What trends have you noticed with insurance? What are other practices in your area investing in? What’s it going to cost you? Can you “justify” these expenses? It’s also important to reflect on your practice and what has worked and not worked in the past. Think about how many new patients you are currently getting each month… Where are they coming from? How are you getting them through the door? Are you spending money to acquire new patients and not getting the results you want to achieve? Why not? As you drill down into the details of the questions above and really think about your strategy as to how you are going to achieve your goals, it’s time to do your homework and find the best solutions. Your due diligence will lead you down the right road. Build a list of questions before you talk to any sales representatives, base them around the pulse of your business (finances, marketing, softwares, etc. ), know your budget and make sure the result you are looking to achieve can be attained with the option you have chose. In many instances, it’s not 1 thing that you do… It’s many things that all work together. Keep in mind that you often have to spend BOTH time and money to get the right results. If you don’t want to put in the time and do not allocate the tasks to your staff, you’ll probably have to pay a premium to meet your goals on schedule. Which is ok (for some)… Because with every new patient you bring in, it will also bring in a certain amount of revenue. Every dollar you spend trying to acquire a new patient, will very likely return fivefold if you’re properly managing your practice. Download our free eBook on how to grow your practice. There’s a great workbook at the end to help you organize your thoughts so you can make a great road map for 2017. At Connect the Doc, we are strong believers in internal marketing. We’ve found that reviews and referrals are the pillars to a practice growing the right way. Generally, we start by building a baseline of reviews on popular sites like Google, Yelp, and Facebook. We do this because patients do their homework when choosing a dentist. No matter how much money you are spending on advertising, most new patients will read your reviews before scheduling an appointment. Same goes with referrals, even if your existing patients are referring their friends… If their friends come across your Google page and you only have 10 reviews, you may be missing out on opportunities to convert referrals. Once you build the baseline and have a system in place to help you with reviews and referrals, you can start to invest in other forms of marketing to reach your goals.With every google search of your practice, new prospective patients will find you more easily and see what trusted patient’s have to say about you. 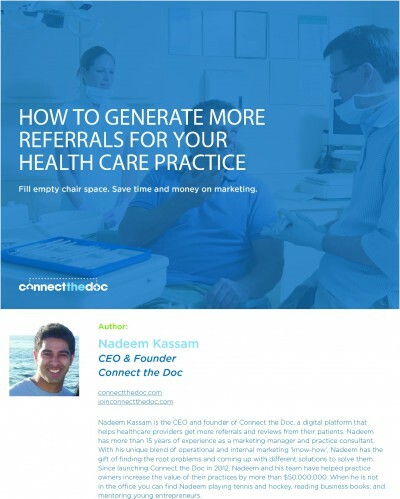 To leverage the positive experience of your patients, our referral system runs through Facebook, on your patients profiles, to reach 100x more patients than word of mouth referrals. If you’d like to chat with us about your marketing strategy for 2017, regardless of whether or not it will include our reviews or referral software, please feel free to contact us at 415-287-4999. We’d love to help in any way we can and provide you with our input.